Congratulations for making it to this page! I know not many are going to be able to do so, as they may not want to go beyond the typical sewing machine options: Singer and Brother. Now, don’t get me wrong. It’s only natural for people to choose a much more popular, well-known brand than one that not many know about. However, for those like you that have decided to give the other brands a chance, are much more likely to find a much better option at a significantly cheaper price. And when it comes to that, Juki really is your best bet. It doesn’t offer the cheapest products on the market, but it offers premium quality sewing machines at “far from premium” prices. 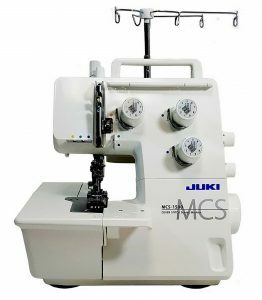 While there wasn’t exactly a shortage of chain stitch sewing machines on the market, the Juki MCS-1500 made all the other options look like nothing as soon as it was launched. It has everything the most popular options in the category have to offer, but it also offers a lot of other features and is way more functional. The Juki MCS-1500 is still a fairly “new” product to have hit the market. However, that hasn’t stopped it from being the top contender for the title of the best chain stitch sewing machine. This is clearly evident in the fact that it has received universally positive ratings and reviews. I’m yet to come across a customer review that says that the customer didn’t like the product. This speaks volume about the MCS-1500’s ability to meet the needs of every type of sewer, thanks to its superior versatility. Getting to some of its important features now, didn’t I just say that the MCS-1500’s versatility is praiseworthy? Well, it can make both cover stitches and chain stitches with a level of efficiency that would totally blow you away (imagine never coming across a skipped stitch ever again!). This is especially true if you have ever used a cover stich machine from one of the more popular brands in the past. They just don’t have the kind of efficiency that’s needed for different sewing projects involving cover and chain stitches, and they can be a nightmare when you’re working on more complicated projects. Now, to get a little more specific about what the MCS-1500 can do for you, it can help you with pretty much EVERYTHING ranging from simple hems to challenging necklines. It’s the perfect choice for projects that involve stitching the waist and side seams of pants, thanks to its ability to sew strong stitches on stretchy fabrics. Similarly, it’s also a great choice for producing beautiful decorative necklines. Finally, despite everything that the MCS-1500 brings to the table, it’s incredibly easy to use. If you even have some experience with sewing in the past, you would be able to sew in a way that would feel like you’re sewing through butter. The threading is just as simple and you will have your machine ready to get grinding within an hour of unpacking it. The tension is surprisingly easy to work with as well, and it works fairly quietly. Overall, I think it’s a solid option for everyone looking for a cover stitch machine, even if they can afford buying a much more expensive one. However, not everyone reading this are interested in a cover stitch machine. So let’s get to my next pick, which is a lockstitch sewing machine. First things first, don’t let the stupid simple look of the Juki TL-2010Q fool you into doubting its functionality. It’s a beast of a lockstitch machine, and my personal favorite in the category. And being my favorite pick has to mean something. Basically, it can handle pretty much everything you throw at it, and do an amazing job each time. You would find the TL-2010Q becoming your go-to machine for everything quilting and piecing as soon as you start using it. It brings a lot of power with it and would breeze through heavy duty and even industrial-level projects. And even with that kind of sewing strength, the TL-2010Q magically manages to be perfectly efficient. I really think it produces the best quality stitch you may have ever seen a machine make. Also, unlike many of the other machines in this price range, the TL-2010Q is not a computerized machine but a mechanical one. This means that if it ever fails, you wouldn’t have a terribly expensive motherboard to replace but rather just some fairly inexpensive metal stuff. As for some of the other technical features, you have a thread cutter that never disappoints, adjusting the needle being a very simple task; the bobbin winder being smooth, fast and efficient and many more. Want to stitch through five layers of fabric like a dream? BRING IT ON as the TL-2010Q likes to “crush” challenges like that. Think you could sew better with the quilting pins in place (which pretty much no other machine allows you to do)? Well, the TL-2010Q wouldn’t have a problem accommodating THAT as well. Perhaps something you will find more surprising is that despite its power and industrial-grade functionality, it’s a PORTABLE machine. Now, by portable I don’t mean something that weighs 15 pounds. The TL-2010Q actually weighs around 40 pounds, but it’s designed in a way that it can easily be moved around. To sum it up, it’s worth every penny it asks for. If you’re into some serious sewing stuff, you wouldn’t think twice before hitting that “Buy” button on it. 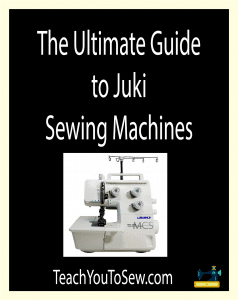 The Juki MO-1000 is a super sophisticated overlocker sewing machine from Juki. It comes with many advanced features that make it an extremely functional, efficient serger. The jet air threaders the MO-1000 comes with make threading look not much short of a magical process. No wonder the seller proudly claims that this serger utilizes the power of air to offer effortless threading. Then there’s the adjustable differential feed that you would expect at this price point, but it’s designed in a way that it enhances both the functionality and ease of use. 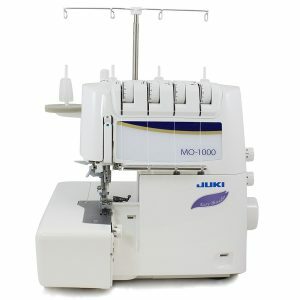 The MO-1000 sews flawlessly and with a great efficiency. Changing the thread color or rethreading would be a breeze with it, which is very relieving given that it can be a total mess even with machines costing much more than the MO-1000. Something that makes the MO-1000 clearly stand out from all the other overlocker sergers on the market is its ability to thread itself. If you have ever used a serger before, you know you would probably quake in your boots when it would come to threading the serger. Not with the MO-1000 though. The self-thread option would definitely be a dream come true for anyone that uses any other serger, and people with a weak eyesight are going to bless the manufacturer for sure. The MO-1000 is also very versatile with features like easy 2-/3- thread conversion, automatic rolled hemming (just imagine how less challenging sewing would get with this wonder serger!) and being flexible enough to allow you to turn off the upper knife feature. It also comes with a long list of accessories, including an instructional DVD that you’re going to find very useful. If you’re on the fence on this one due to the price, then let me remind you that you get what you pay for. For the kind of durability you get with the MO-1000, I would be surprised if it lasts you anything less than a lifetime. Alright let me tell this right off the bat that if you’re a beginner to sewing, just STOP reading here and move on to the next one. This thing is just NOT for a beginner. It comes unassembled and doesn’t include any instructions on how to assemble it. This is sufficient information for us to conclude that, if you have been into sewing for just a couple months or so, you will likely not even be able to put it together, let alone use it for what it is. With that out of the way, let me also reveal that if you’re after a BUDGET sewing machine that’s perfect for industrial-level projects, you have likely found your new sewing partner. 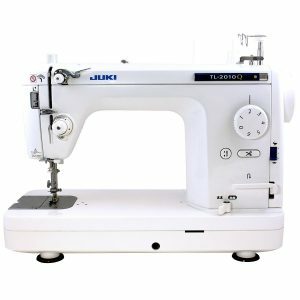 The Juki DDL-8700-H is nothing like anything, as it can sew at a jaw-dropping speed of 5500 stitches per minute. Then there’s the 11-inch arm space, which would leave you with enough room to work comfortably even when you’re working with the largest of quilts. Besides its insane sewing speed and ability to work on complex, large projects, it also offers quite a bit of versatility. This is especially true given that it can sew stitches as long as 5mm, and as short as 6 stitches per inch. This means that it’s always going to be right up to any task, be it offering you more freedom with respect to the stitch length or doing a close job. It also boasts the Single Needle Lockstitch mechanism, which is almost a surefire way of making high-quality garments. Worried about having to spend hours to take care of the maintenance needs of this sewing powerhouse? Well, you will be glad to know that it comes with a fully automated lubrication system leaving you with little to do on that front. 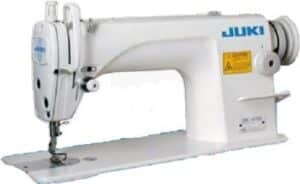 Another thing that will make you feel product of owning this surprisingly affordable industrial-grade sewing machine is that it’s an eco-friendly product, and meets the eco products standards (of Juki) aimed at preventing the damage to the environment. It’s also unbelievably quiet for an industrial-grade machine and has rock-solid durability. The only thing you may struggle a bit with is the installation, but once you’re done with it, you’re likely set for decades of some serious, solid, breathtakingly fast sewing. The Juki MO-655 is the most affordable product on this list, but that shouldn’t be mistaken for a lower quality. It’s actually a surprisingly functional serger with many advanced features. To begin with, there are color coded threading guides that are going to save you a LOT of headache. The 1-rotation thread tension dial, too, would make life easier for beginners. A knob that you can use to effortlessly control the lower knife; talk about being both functional and convenient to use at the same time! The reason I’m so impressed with the MO-655’s overall functionality is that it really has pretty much everything you may ever need when working on a variety of sewing projects. 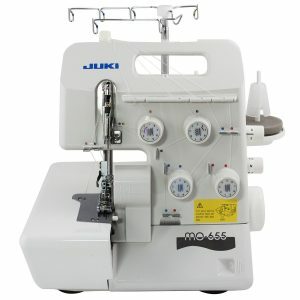 It’s not that there are no other sewing machines or sergers that can offer the same; BUT at this price point, you would probably have to be beyond lucky to get the kind of functionality that the MO-655 offers. Just to give you a better idea of what exactly I’m talking about, there are also features like a 2-needle sewing option, a built-in rolled hemming feature, overlocking features, making great 5-thread safety stitches, flatlock variations, a chain stitching option and more. Have you ever come across a serger offering ALL these features for a price anywhere near to that of the MO-655? Simply put, this hidden gem is a no-brainer for anyone looking to work on a wide range of sewing tasks with a great level of efficiency, but doesn’t want to break the bank buying one of those “high-end” sergers.